No, not the breath freshener candies. Yesterday was rather long. First time I experienced black Friday from the retailer point of view, pretty brutal. Needed a food pick-me-up after my shift. Luckily, the mall grocery store had this. 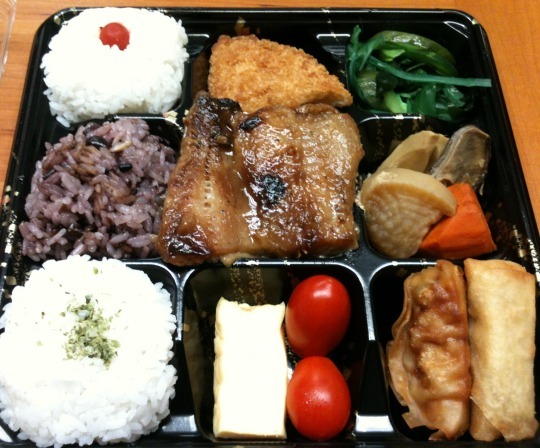 A little different from the run of the mill bentos I usually pick up. 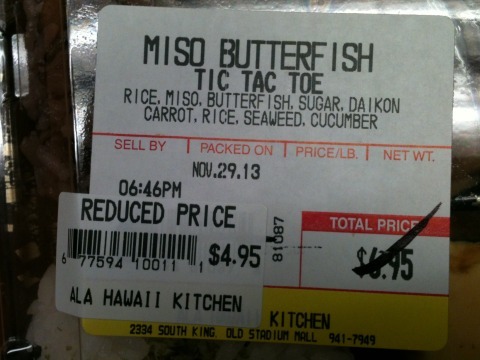 And better yet, it was reduced. It was more about the eye appeal although the taste wasn’t bad either. Three “squares” of rice (sekihan in one). An unidentified croquette, miso butterfish, Japanese steamed omelet, grape tomatoes, pickled seaweed and cucumber salad, oden vegetables, a gyoza, and an eggroll. While the socks did not come off, it was mall food afterall, still a nice “reward” for a long day. So, how was your black Friday? Did all your shopping? Or just avoided the chaos all together. I dunno. Didn’t get to experience it … yet. 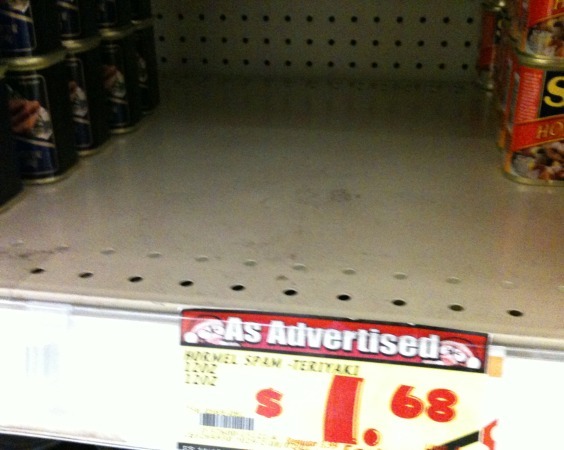 Last week, one of our Japanese grocery stores had SPAM on sale. Not that unusual since SPAM is on sale here, somewhere, almost weekly. What made this sale interesting is that the store advertised other varieties, not just the regular or “diet” varieties of SPAM, including “teriyaki SPAM” Whoa! First I’ve heard of commercially produced teriyaki SPAM. Almost p’d in my pants I was so excited. 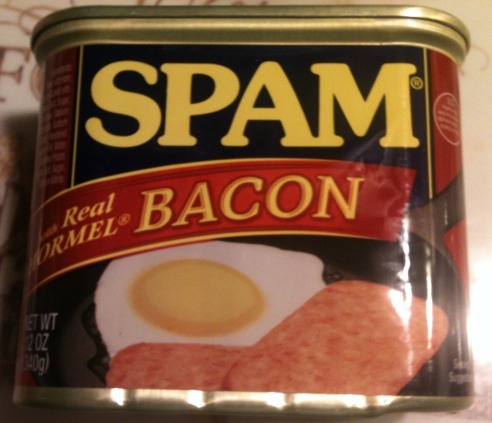 Now, teriyaki SPAM is not a new thing. 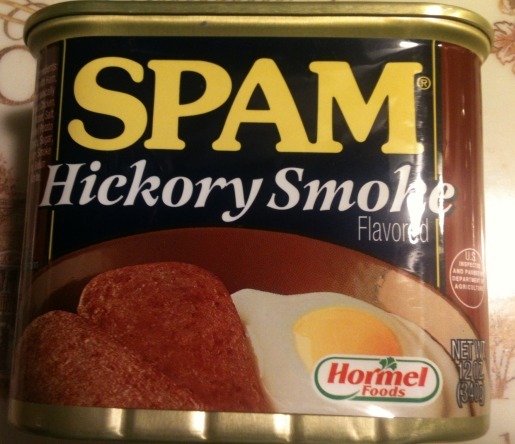 Over here, the Japanese “delis” make their own versions of teriyaki flavored SPAM, but something commercially made? I had to check it out. Unfortunately, this is what I saw at the store. As consolation, I picked up these. Still looking for that teriyaki version though. Sigh. I’ve never been a big fan of roast turkey. 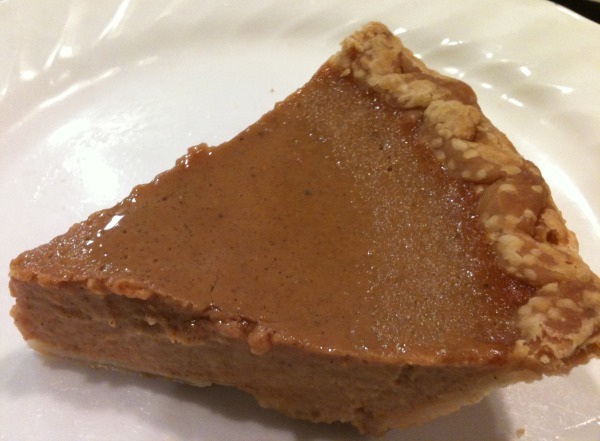 Growing up time, the turkeys at home were dry, overcooked, and pretty tasteless. We were scheduled to pick up The Cat’s mother from the airport today, which we did. 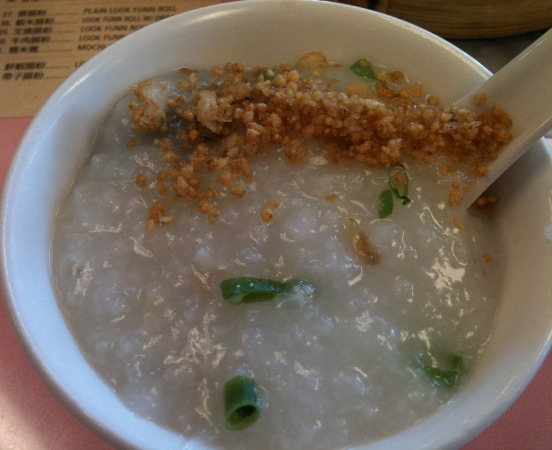 I had in mind since Thanksgiving is not The Cat’s holiday, and the mother probably needing some Chinese comfort food, to go somewhere for “jook” (Chinese rice porridge) for her, and roast duck for me (and that would be my Thanksgiving fowl). Well, she got her jook. But the duck at the restaurant look too bony (skinny duck). I took a pass. Contemplating plan B, turkey came to mind. Why? Dunno, maybe it’s being surrounded be the Thanksgiving paraphernalia at Willie’s planted some subliminal messages in my brain. NSA are you fooling around with turkeys too? Hee hee. After some pondering and discussion, we ended up at Zippy’s, a local style diner chain. The Cat was not amused. I got my complete turkey dinner. The Cat settled on won tun mein. Which she was pleasantly surprised was actually decent. 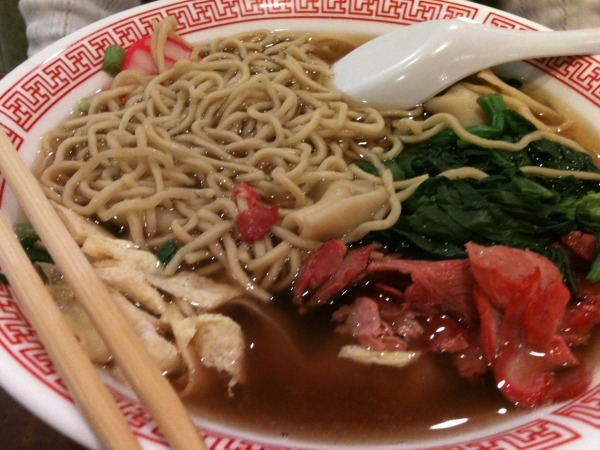 Noodles, won tun, greens, and slices of char siu (the real red stuff). 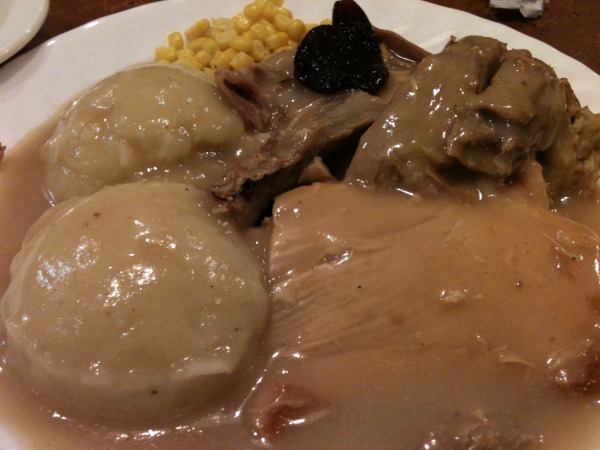 As for my turkey dinner, it exceeded expectations. The turkey was moist and tender and everything else was well prepared. Nothing fancy or gourmet, just simple food. One sock off. 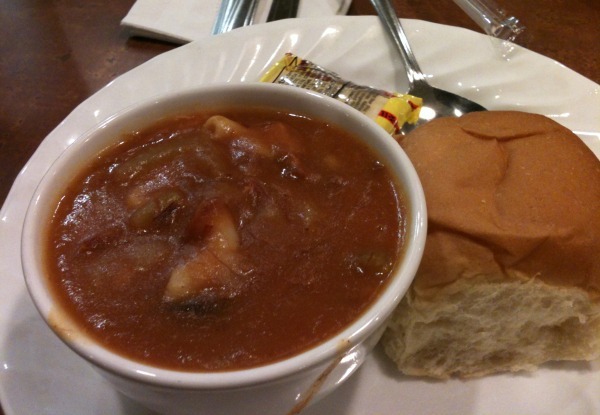 The Cat had to admit Zippy’s makes acceptable homestyle food. She still wouldn’t recommend the fancier selections though. Sometimes, the day doesn’t go as planned, and that’s okay. I have an early morning shift at Willies tomorrow so zzzzzzzzz time. I will get to your comments as soon as I can. A care package from the San Francisco relatives. Since I missed Sunday’s lunch. 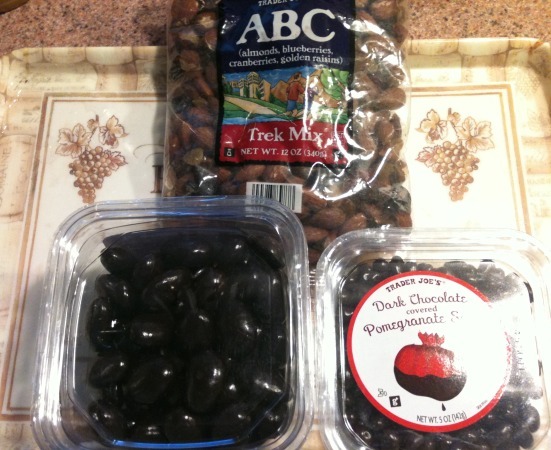 Trail mix, dark chocolate covered almonds, and dark chocolate covered pomegranate seeds. For me, stuffing is the best dish of the Thanksgiving meal. Last night, Willie-Sonomies was sampling their boxed stuffing mix. At closing, I drew kitchen clean-up. 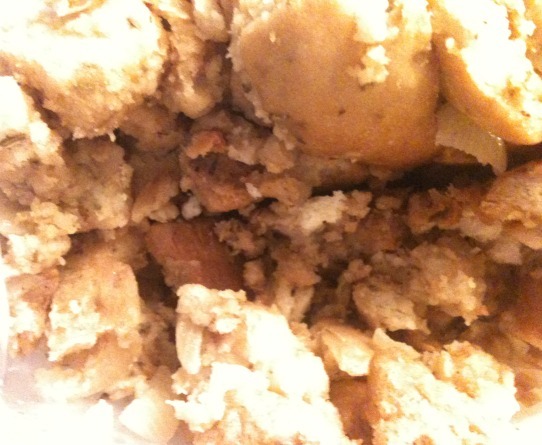 Since it’s store policy not to serve their “guests” leftovers, I packed up the leftover stuffing and took it home. It’s not as moist as I like it, but considering it was in the warmer all day, the stuffing held up pretty well. 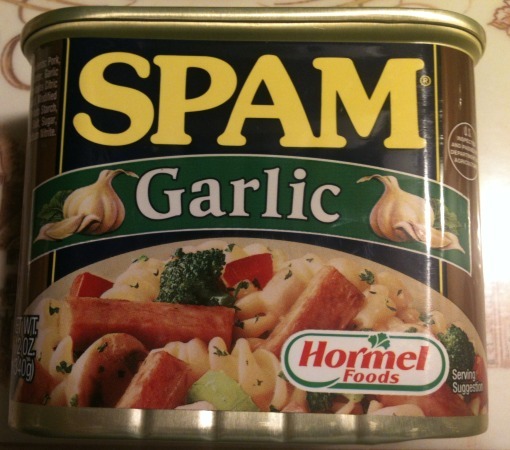 Maybe I’ll reheat it with some braised pork belly … or SPAM! And gravy!